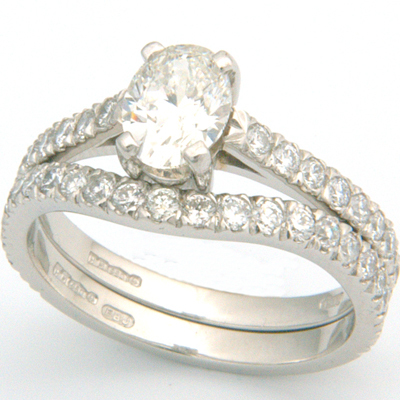 Platinum Two Thirds Diamond Set Fitted Wedding Ring — Form Bespoke Jewellers Ltd.
Two thirds diamond set fitted wedding ring, cast in platinum. This bespoke diamond set fitted wedding ring was handmade to fit perfectly alongside the customer’s diamond set engagement ring. The engagement ring was also made by our recommended jewellers here at Form Bespoke Jewellers. 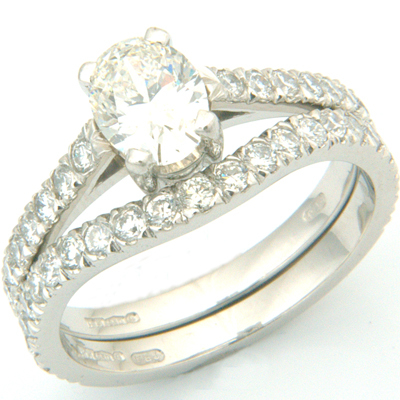 The platinum band is two thirds diamond set, mirroring the engagement ring, so the diamonds finish perfectly in line. This engagement ring and wedding ring pair is the first of a faceted range by Form Bespoke Jewellers.